Perfect for a family or two. The master bedroom sleeps up to four with one queen and a twin over twin bunk. The guest bedroom sleep 3 with a queen bed and twin bed. An open floor plan allows for lots of natural light and easy entertaining with a full kitchen, dining and living space. There is also a sofa bed in living room. The Whiskey Tower sits at the base of Red Cliffs and “Whiskey Run,” which can be accessed from Chair 2, Caples Crest. These residences offer the resort’s highest elevation accommodations standing 8 stories tall. 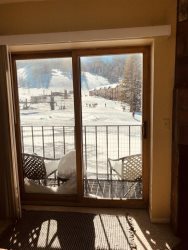 The 7800 Bar & Grill is located on the 1st floor which also offers a large deck that many people enjoy while eating, socializing, and relaxing in between runs and après ski. Sitting slope side, this lofty property offers some of Kirkwood’s prime views of the Red Cliffs and the other iconic peaks as well as the Village Plaza and their 5 chair lifts that are all with in skiing distance. This condo is allotted 1 assigned parking spot behind the building and offers additional guest parking on Powerhouse Rd. or Timber Creek lower parking lot. Access the building after traversing the large common area deck and take advantage of the elevator.